The place – a long mile up remote, little known Goss Canyon in La Crescenta next to the Angeles National Forest. The time – the morning of September 17, 2000. Air Force Master Sergeant Paul Hayden and his brother start walking into the old horizontal water well. Hayden had grown up in La Crescenta and had gone into the old well, opened in 1907, many times before. He was now a skilled U.S. Air Force para-rescue instructor. On this trip he intended to go farther than ever beforeby passing sumps hundreds of feet deep in the old well. About 150’ in they encountered water. His brother remained at the water’s edge holding one end of a thin retrieval line while Sergeant Hayden continued farther with scuba gear.His primary light was a waterproof video camera lamp. However about 20 minutes later something went terribly wrong and the brother could no longer move the line. He hurried to the nearby La Crescenta Sheriff’s office for help. Soon rescue personnel from several agencies using four-wheel-drive vehicles to traverse the old, treacherous dirt road arrived outside the well entrance. First to arrive was the LA County Sheriff’s Dept. including the Montrose Search and Rescue Team quickly followed by the LA County Fire Dept. About 150’ beyond the water’s edge they found an old ceiling collapse had partially blocked the tunnel forming a dam which flooded the area beyond. Several ventilation fans were installed to increase the oxygen level to an acceptable range. Mark Lonsdale, training officer of theLA Sheriff’s Dive Team and a nationally known cave and mine rescue diver certified by the NSS Cave Diving Section , entered the sump occasionally passing through air pockets. About 185’ into the flooded section and over 400’ from the entrance Lonsdale found Sergeant Hayden’s body in a long partially water filled passage. His head was under water and the regulator was out of his mouth. His scuba tanks were nearly full. Lonsdale fortunately resisted the temptation to remove his own regulator. Subsequent samples from the air space showed only 4% oxygen. Normal air contains 21% oxygen. Breathing air containing 15% oxygen will cause dizziness and headaches and air containing 9% oxygen will cause unconsciousness. Breathing air with 7% or less oxygen will cause the required oxygen supply to the brain to be immediately shut off, a condition called asphxia. It was reported that prior to the trip Hayden had agreed with his para-rescue co-workers that he should not remove his regulator . He obviously did – a small mistake with fatal results! I recently walked up Goss Canyon and easily found the old well now strongly secured with a locked gate. I talked briefly to the owner, a Mrs. Pruitt, who says she discourages visitors because of liability concerns. My sincere appreciation to grotto member Rich Meline who patiently explained the details of the rescue and the cause of death. Rich is a long time member of the LA County Fire Dept. Search and Rescue Team which includes mine and cave rescues. He and his co-workers in the past year or so have done extensive training and search exercises in the Big Horn mine system near Mt. Baden-Powell which has an estimated length of two miles, arguably the largest mine in Southern California. Rich emphasizes that mines and wells are inherently more dangerous than caves since there is much more likelihood of collapse and the possible presence of toxic gases and low oxygen levels. All of their exploration of the Big Horn is done with atmospheric monitors. Less than two years later a similar tragedy occurred in the Cleveland National Forest on June 23, 2002 when two young brothers free-dived a sump in one of the numerous entrances to the old Blue Light Mine near Silverado in Orange County. 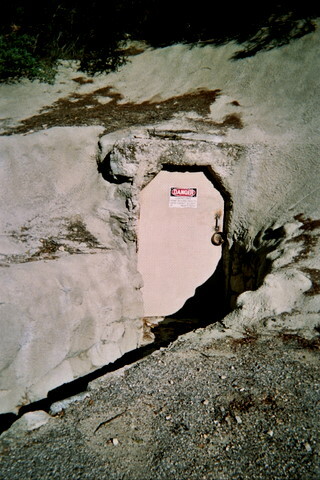 According to the state mine report they died almost immediately after exiting the sump since the air in the passage beyond was found to contain only 4% oxygen. As I write this article the bodies of three teenagers have just been removed from a labyrinth of mines along the Mississippi River in St. Paul, Minnesota and a fourth is fighting for his life. At least five other young people have died in these mines in the past 20 years. They were originally dug by sandstone miners back in the 1880’s. The cause of death was reported as high levels of carbon monoxide fumes. The air also reportedly contained only 15% oxygen. Does this mean that we should stop exploring mines? No more than we should stop swimming in the ocean or lakes because there are drownings or stop climbing mountains because of climbing accidents or stop caving because there are caving accidents. It does mean that we should exercise common sense in our mine exploring activities. For example plunging into a sump is certainly a high risk undertaking which should be left to the experts. I have been in the Big Horn Mine with its many levels and thousands of feet of passage many times but never by myself. There are two local mines I will never go in. They are the Governor and Red Rover near Acton off the Antelope Valley Freeway. They are certainly vertical going down a reported thousand feet with water at the bottom. The body of one man who perished in the Governor in 1981 has never been recovered. It was simply too dangerous to attempt a body recovery. A successful rescue of another person was made in 1995 only after an extensive rescueoperation. Exploration of local mines can be rewarding and exciting but please use common sense.